Picking a winner for the annual Food City 500 Monster Energy NASCAR Cup Series race at Bristol Motor Speedway sounds like a *colossus-sized problem, but it's really quite simple. I mean really, who else do you choose to wind up in the winner’s circle at Bristol but a Busch? Kurt or Kyle, take your pick. Between the two brothers, they’ve won 13 Cup races at the *Last Great Colosseum. Thirteen! That many BMS winners’ trophies stacked end to end would stretch from Bristol all the way to … well, it would be a really, really long way. Each trophy is as tall as a sequoia! Both Kurt and Kyle are former series champions and you just can’t go wrong picking one of the two Las Vegas native sons at Bristol. Did you know: Kyle Busch has crashed out of exactly ONE-HALF of his last eight Bristol starts? That’s a *concrete fact right there. Four big ol’ DNFs to go along with all that success. And older brother Kurt? Sure, he won the last Cup race here, back in August, but he didn’t finish in the top 20 in three of his four starts before his win. Beyond the Busch brothers, there’s a handful of drivers who always seem to be running in the top 10, if not contending for the win at BMS. Folks such as Kyle Larson and Jimmie Johnson, Kevin Harvick and Ricky Stenhouse Jr. Sadly, Larson and Johnson, Harvick and Stenhouse will have to settle for another top 10 finish but no Food City 500 checkered flag. Nope, this year’s winner has rarely finished outside the top 10 at Bristol. Let me *volunteer this name, and don’t think it’s *hokie. - the winner will be Ryan Preece. But back to Preece, the rookie driver of the No. 47 Chevy Camaro for JTG-Daugherty Racing. I know his stellar stats (one win, seven top-10 finishes in eight starts) are from his Modified races at Bristol, but that’s beside the point. The kid’s got the work ethic of those racing legends whose names now line the BMS record book. He knows his way around Bristol like the back of his, uh, racing glove. AND – he won the Xfinity race here a year ago. Why go with the norm? Go with Preece instead. After all, it’s Bristol, baby! Of course, besides winning one of the gladiator-style swords – another incredible perk that goes only to BMS race winners – racers at Bristol have been known to occasionally make contact, which often leads to confrontations. Which then winds up on Colossus TV and results in much cheering and yelling from the fans. Through the years we’ve seen Kevin Harvick go after Greg Biffle, Jeff Gordon go after Matt Kenseth, Tony Stewart go after Kenseth, Danica Patrick go after Denny Hamlin, Joey Logano go after Hamlin … sometimes you don’t need a program at BMS, you need a fight card. So who are the likely candidates to take their dustups from behind the wheel to outside the car? The favorite would have to be Michael McDowell, who has already been at odds with Joey Logano and Daniel Suarez this season. There’s only one problem – McDowell hasn’t stuck around long enough to get into an altercation at BMS. 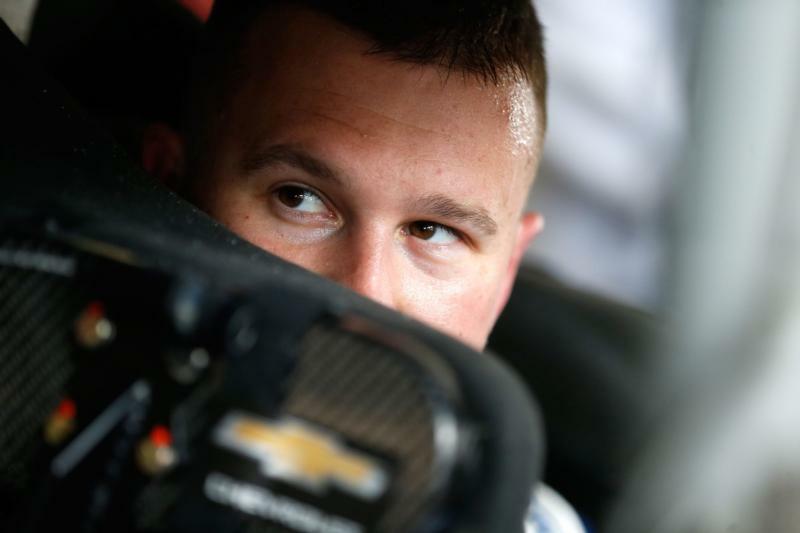 In 2018, the Front Row Motorsports driver completed only a combined 19 laps – out of 1,000! – on the fabled high banks. Some folks just seem to struggle when competing at the *World’s Fastest Half-Mile, and last year it was McDowell. While the Food City 500 is the main course, race fans can whet their appetite on Saturday when BMS hosts the Alsco 300 NASCAR Xfinity Series race. Your best bet for the win there is Justin Allgaier. The JR Motorsports driver has finished outside the top 10 only once in his last six BMS starts. Allgaier has often been referred to as the "Little Gator" which seems odd since he’s from Riverton, Ill., which isn’t exactly the gator capitol of the world. Or even the gator capitol of Illinois, for that matter. When cars aren’t on the track, race fans can still find plenty to do around BMS. The free Kids Zone area is located in the Fan Zone located near the north entrance to the facility and is open Thursday through Sunday of race week. And there are always plenty of souvenir trailers and corporate displays fans can visit during the race weekend as well. New for 2019 at BMS are the Turn 1 Tavern, an indoor/outdoor suite featuring a cigar lounge on the inside and incredible racing action on the outside; the BMS Fun Squad patrolling the grandstands and handing out prizes during breaks in the on-track action; and all-new Half-Mile Hangouts – lounge areas that offer a relaxed atmosphere while providing free Wi-Fi and charging stations, games and a selection of craft beers. There’s also camping, tailgating and concerts. Did we mention the new pre-race show? That’s going to be a really fun time with more pyro, smoke and music. In less than two weeks, NASCAR fans will have their first chance to witness short track racing at its best and see the top NASCAR stars in action, such as those mentioned above and a few others, like Chase Elliott, Martin Truex Jr., Ryan Blaney, Clint Bowyer, Brad Keselowski, Bubba Wallace, and Erik Jones during the April 5-7 Food City 500 weekend. In addition to Sunday’s Food City 500, the event also will showcase a Saturday doubleheader with the Alsco 300 NASCAR Xfinity Series race and the Zombie Auto 150 NASCAR K&N Pro Series race. On Friday, the Cup Series stars will try to break the BMS track record of 131.668 mph (Denny Hamlin, Aug. 2016) as they qualify during Bush’s Beans Pole Day. Friday afternoon’s Food City Family Race night, held at the track, is one of the longest running fan events on the NASCAR circuit.